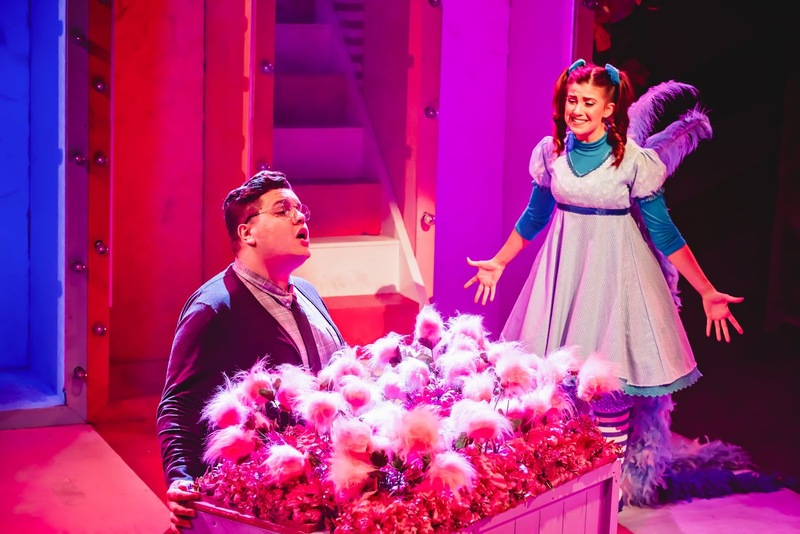 Seussical intertwines many of the most beloved Dr Seuss stories, with characters like Horton the elephant, the who’s and the Cat in the Hat all featuring in the show. The story follows Horton as he finds the world of the Who’s on a speck of dust, he must save them and bring them to safety but along the way runs into many problems all whilst being pursued by Gertrude who ends up helping him out. The thing that I left wondering was where is this shows audience. It is primarily a children’s show but I’m not too sure if this production allows children to be involved in the right capacity. 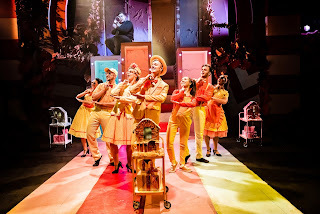 The space is not very big and, of course, is amazing for children to have this story played within reaching distance of them but at points they lose interest it becomes very obvious to the rest of the theatre. The show has flaws within the writing, the show resolves itself in a matter of seconds towards the end. So quickly that I missed what was happening and it was the finale before I could figure it out. Some of the characters feel irrelevant and the music isn't very memorable. 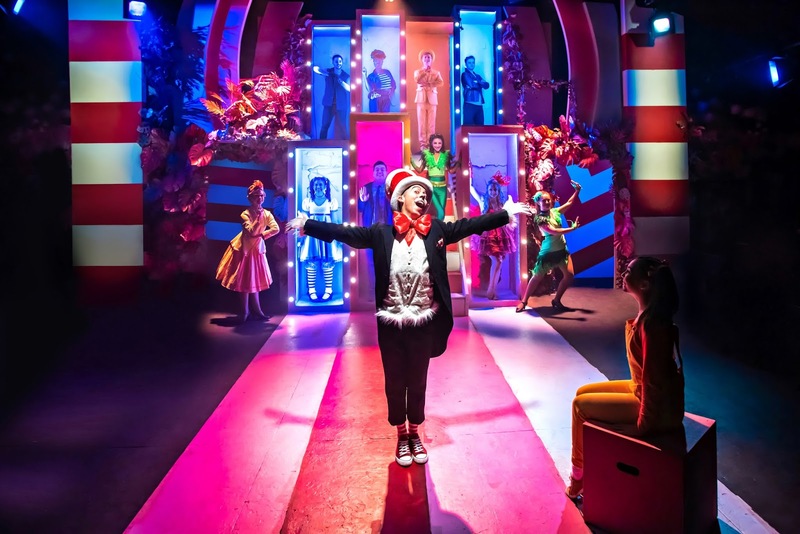 Its a crazy show but it does embrace the world of Dr. Suess to a T. The show, design and direction all contributes to this magic. 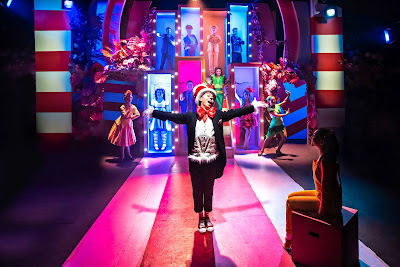 James Tobias directs the show and the way it moves is very smooth; every element of the show pulls together to achieve the world of Dr. Seuss and it payed off. Chris Whittakers choreography in this space it was too much, there is so much going on we can’t focus our attention on whats most important. On a bigger stage in a bigger venue it would be wonderful but here its cramped and too complicated. Credit must be given to Justin Williams, Jonny Rust (Set Design) and Rachel Cartlidge (Costume Designer) who transported us to this mad world and brought fresh and interesting ideas to this interpretation of the show. The sound let this show down. The band were too loud and the mics did not match their levels, I struggled to hear parts of it. In a space like this it doesn't need to be at that level, we are watching a children’s show after all, not a concert. The cast is wonderful, a hugely talented bunch of young actors who showcase themselves brilliantly. Possibly some press night nerves in the early portion of the show, elements were slightly messy but they eased into it as it went on. Scott Paige as Horton is a stand out, a role that could have easily been written for him. He has a natural comic awareness whilst also playing the tender and caring side of the character with such precision and carefulness. Marc Pickering also stood out as The Cat in the Hat, acting as the narrator in the show he had such a brilliant understanding of how to play the audience and make us feel like we were being guided through this story by him. He was the audiences friend and companion. The part itself is actually quite small in regards to the amount of singing or involvement with the story but it takes the right actor to be able to fill it and make it the lead character. Gertrude was played by the wonderful Amy Perry who just seemed to embody the character with no trouble whatsoever. She has a wonderful voice but she also played it so beautifully and our hearts went out to her. We were completely behind her character and she had each and every single audience member cheering her on. 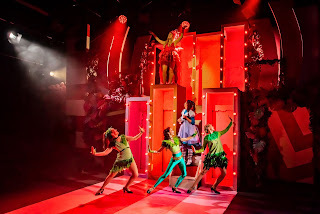 The rest of the cast were fabulous and embraced this show 100%, performing it within an inch of its life, giving it everything they could to tell the story. Stand outs being Adam Dawson and Daisy Steere. Even though this show does have important messages I don’t feel like the writing allows them to be fully realised and investigated. It moves too fast for us to really understand and get into the characters heads but perhaps I’m looking too much into it. Would I take children below the age of 7 to see this show? Absolutely. Would I recommend this to anyone else? I’m not too sure.